What is the first thing someone asks when you invite them to a party? “What can we bring?”, right? If you are like me, you spend the entire week heading up to the event on the phone coordinating who is bringing what. Either that, or you just tell everyone you’ll handle all of it just to avoid the coordination nightmare. If you are like me and even if you do elect to become the who is bringing what coordinator, you probably end up bringing a lot of extra stuff just to avoid the ‘1 bag of chips for 30 people’ situation. I just check ThingToBring on my iPhone throughout the week and supply the rest. Party planning perfection! ThingToBring is all about who is bringing what to the party. 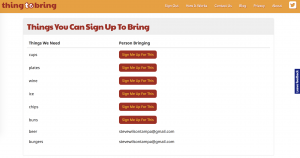 No fancy themed graphics (I’m a crappy graphics designer anyway) or anything else that gets in the way of you creating a quick sign up sheet to send to your invite list so they can start contributing to the event. I like to have cookouts and I am obsessed with tailgating for college football (USF Bulls, GO BULLS!). My friends want to bring their favorite pasta salad and their amazing hummus and I want to empower them to do so. When I see someone at halftime and they say they want to bring their 10 friends to the next tailgate, I want to be able to pull my phone out of my pocket and add them to the next tailgating signup sheet. Bring all of the friends you want, here’s what you all can bring! 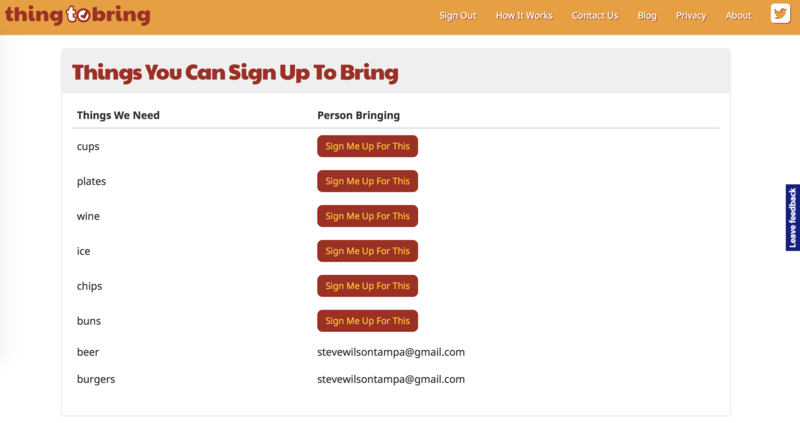 This entry was posted in Uncategorized and tagged sign up, sign up sheets, signup by Steve Wilson. Bookmark the permalink.